Looking for some of the best bitcoin mining software for Windows 10? In this post, you will read about some of the best options available for free. The growth rate of Bitcoin in the year 2017 has grown tremendously as compared to the past. Being a new user in Bitcoin mining or the Bitcoin management is a new topic about which you want to learn. Let start with the introduction of Bitcoin, it is stated as the type of electronic currency that will not be related or dependant on the currency type of any specific country. Bitcoin or also known as BTC is the type of digital currency that was first heard about in the year 2008 newspaper by Satoshi Nakamoto. According to him, it is a random, electronic, peer-to-peer payment system that uses blockchain technology. The thing that makes this system more elusive is that there are no kinds of physical entities for backup as that of printed coins and bills. It is an entirely straightforward process as it delivers all the computer hardware work to the respective Bitcoin network. This is the reason why it becomes necessary to you that you get the right kind of hardware needed for it to process. Then, in the end, the software process receives the final work from the many miners across the network. Bitcoin monitors the input & output transactions within the Bitcoin network and own hardware. It shows the stats such as hash rate, temperature, fan speed, and mining speed. When the purpose is Pool Mining, then the software connects to a mining pool. There is no need of using a mining software doing a cloud mining. The users can mine their Bitcoins manually. But if you take help of bitcoin mining software then can optimize the process of mining while keeping you stress-free. Now you might be wondering is there any good bitcoin mining software for Windows 10 available? The answer is Yes. There are some trusted and useful Bitcoin mining software’s available that can be used by some operating systems. This system is considered among the most popular Bitcoin mining software types for all the systems which include ASIC, GPU, and FPGA. CGMiner is available for all kinds of operating systems including Linux, OSX, and Windows 10 as well. This software is programmed in C and is considerably coded that is based on the previous model of CPU miner. Use this link to download. This software is customized for ASICs, and at the same time, it is opposed to becoming completely GPU-oriented just similar to that of the CGMiner. It comes with its monitor that does the over-clocking along with the fan control. The user can reorder the ADL system with PCI bus ID. Download this Bitcoin Mining Software for Windows 10 PC using this link. Bitcoin is an app available in windows store for the Windows 10 and Windows 8.1 version. The interface of this software app is easy to be used, and it is recommended for the fast sharing submission. It comes equipped with default power saving mode. You can avail profit reports jus to track the mining progress. The feature is similar to one offered by Easy Miner. Grab the app using this link. It is also one of the most trending Bitcoin mining software as seen across the world. This software is based GUI that helps to access to both the stratum mining protocol and network mining protocol. It looks after the miner and at the same time also records the graph performance that you can easily access to examine the transactions efficiently. Designed for both solo mining and pool mining. This software can be downloaded using this link. It is also one of the most popular systems for the Bitcoin mining listed on this page. The Multi miner is a desktop app which is compatible with all majors operating system like Windows, Linux, and the Mac. The application is perfect for both Litcoin and the Bitcoin because it includes the provisions to switch between the devices such as FPGA, GPU, ASIC, and others. You can also grab Multi Miner for your Windows 10 PC using this link. 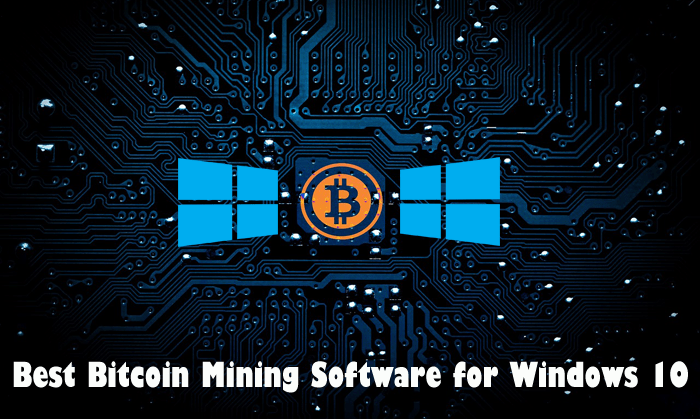 These are some of the best Bitcoin Mining Software for Windows 10 PC. I hope you find this opinion piece useful. Let me know if I missed any excellent application or software.